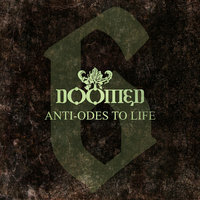 “6 Anti-Odes To Life,” is the sixth release from German Doom Metal band DOOMED. They formed in 2011 so they have been very productive. 2018 has been a knock out year for underground Metal, specifically both Death and Doom plus bands that combine both. DOOMED is such a band but they also have a huge Gothic sound to their epic darkness, even including some Funereal Doom into the mix as well. I say “they” but the band is really a one man project as Pierre handles the songwriting and recording. “The Doors,” opens up the able with the rolling thunder of the heavy guitar and the pounding of the bass drum. The two pronged attack is crushingly heavy, almost like a blanket of lead covering your ears. Not only does this set the tone for much of the remaining album but the two instruments compliment each other well. Often times, the strong and creative drumming really keeps the songs afloat; I’m not saying everything else in boring. On the contrary, this album is rather exciting and has many layers—but the drums are a constant highlight and are the most immediate element that grabs you, pulling you under the aforementioned layers. Pierre’s vocals are extremely guttural, as if the vocal chords themselves are being dragged through murky but shallow waters, pulling up unsavory things along the way. If most other extreme vocalists put as much effort in theirs as he does, the world would be a better place. The second track, “Aura,” begins with some lovely acoustics. After the electric void of the first track, this is a nice sudden change of pace. It also reveals that even the darkest and most extreme sounds can still bring variety and other elements. The acoustic guitar keeps going while a lead one grows beside it with distortion backing all of it. The different elements continue to explore the unknown together before blossoming into a song that wouldn’t sound of place on a MY DYING BRIDE album. The sounds contained within are beautiful yet dark, stirring yet so focused. The song is over ten minutes in length but the best part is around the 7:25 mark when a thick riff, double bass, cascading cymbals, and a melodic lead mix with those insane guttural vocals…it is a recipe with strong ingredients that is made into an even better main course. PIERRE truly knows how to take a lot of different layers and directions in a song and put them into something that comes out fresh and clear but still has a grimy, dark atmosphere. “Our Gifts,” comes totally out of left field with tribal like drumming and clean piano. Within the first two minutes or so, the track also reveals smooth clean vocals and some quiet guitar leads, further pushing the band outside of its boundaries while still remaining firmly grasped within its sound. The drums and the vocals once again become the perfect partners and push the song along until it goes clean once again before ramping back up. “Insignificant,” mixes acoustic guitars, distortion, and Death vocals in a way that would make (older) OPETH take notes. Much of track’s remaining minutes uses this sound to its advantage, weaving clean and heavy styles with ease. DOOMED’s “6 Anti-Odes to Life,” is a meaty Doom records that contains a long but incredible journey within its hallowed walls. If traditional, SABBATH worship Doom is more your style, this might take some time to sink in, if it does at all. However, if you prefer Doom to be, well, doomed, dark, gloomy, and down trodden, this album is something you need to here asap.